This is part of the Church Micro series, please bring your own pen/cil to sign the log. Please note that this is an off-set multi. A visit to the churchyard is required. The cache is then a short distance away. The church Micro series is intended to bring Geocachers to various churches all over the UK (and beyond). Some of these churches provide the backdrop of our communities history. Please take some time to either read the cache page or visit the church. Due to the nature of these locations you may encounter some local activity, and I have either tried to ensure that there is safe parking or that the cache is placed out of view wherever possible, so please don't expect a clear run at busy times. This small church was probably Norman as a wholly Norman-looking corbel head remains, and round arches with some nailhead in the wall. 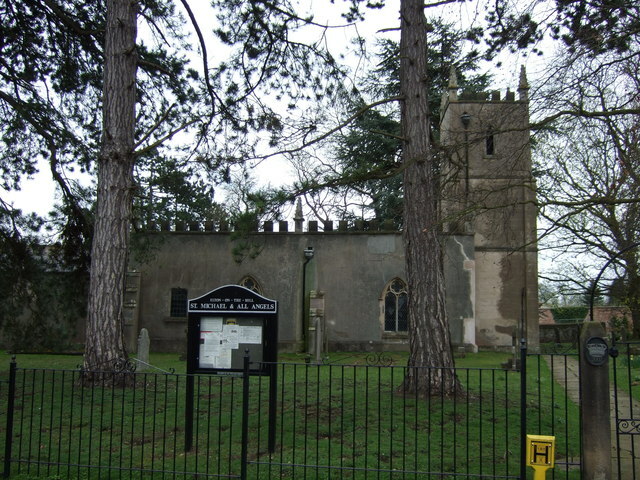 It is a stone building consisting of chancel, nave, south porch and a low embattled tower at the west end containing 2 bells (1702 and 1856). Originally there was a Transitional south arcade demolished in 1786. Its present appearance is primarily the result of the restoration of 1855-7, when the tower was re-built and the exterior plastered in imitation of ashlar. There are 17th century altar rails with balusters. There are mural monuments to Francis Launder (1822), by Joseph Hall the Younger of Derby, and F. W. Norton (1865). A stained glass window in the chancel in memory of Rev. Robert Weatherell, Rector 1851-83, was presented by his widow, who also gave an American organ in 1895. The church was restored in 1909. The church had been described somewhat cryptically as "dove house topped", but obtained its present brick tower at the time of the church's restoration. It contains two bells, and a modern clock installed in 1969, in memory of William Noël and Hilda Grace Parr, formerly of the Old Rectory, who both died in 1967. Remains of medieval stonework can be seen inside on the south side of the nave, including the arches which originally divided it from a south aisle that was demolished. The chancel is narrower. The wooden altar rails are Jacobean.